There’s a new trend spreading among groups of young women in America. And I’m not referring to that whole pregnancy pact thing. Although the trend I’m citing also involves a prick and quite a bit of pain. I’m speaking, obviously, of the young women taking joint trips to their local tattoo parlors to ink themselves up with distinctively geeky symbols and images. Whatever. Good for them. So long as they don’t start that bra-burning nonsense again. Proper support is critical, people. 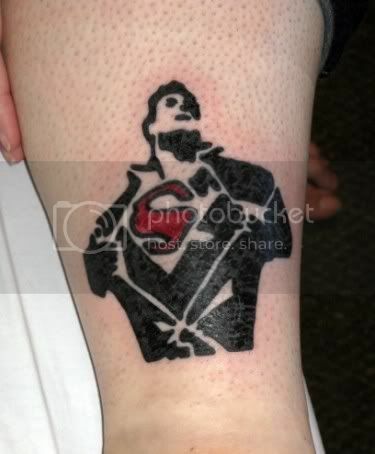 Jessi recently wrote to me about this Superman silhouette tattoo she had done when her friend Lara (previously of Superman – Batman tribal tattoo fame) received a new Batman tattoo. I got this one done when Lara got the Batman chain around her wrist. I found the design on a t-shirt at esty.com, changed the coloring, and had it put just above my right ankle. Do you have a geeky tattoo you’d like to show off? Contact me with a photo and description, and I’ll profile it in a post on this here blog. And I’ll even be gentle about it.